Need a portable air conditioner for your home? 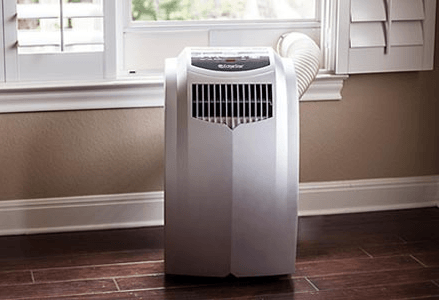 If you've been shopping for a portable AC recently, then you know there are a LOT of choices on the market - from small hand-carried units for a small home office or bedroom, to semi-permanent units meant to serve multiple rooms. When it comes to choosing the best portable air conditioner for your room and unique needs, there are a few key factors to consider - other than brand and price. 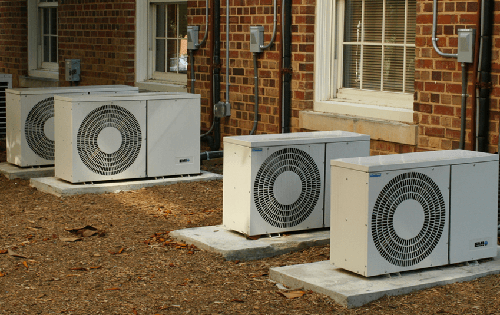 While it may be tempting to just buy the largest air conditioner/BTU rating you can afford, or maybe buy the smallest one thinking it will save you energy, neither of these strategies is smart. how the unit ventilates waste heat out of your room - single or dual hose? installation requirements: are you going to ventilate through a window, door or wall? Not Enough Time to Read Everything? Enter your email below to get this Portable AC Buying Guide emailed to you as a handy .pdf eBook that you can read later on, or share with a friend. The table below lists & compares what I consider to be the best portable air conditioners sold today for use in a typical American home. To arrive at this short list, I researched over 100 units from more than a dozen brands and whittled-down the list based on verified consumer reviews & ratings, brand reputation, how proven the unit is, whether it is sold online or not, and other factors. NOTE: Reading this on a smartphone? Use your thumb to see more products. To create a short list of portable ACs, the first and most basic thing you need to know is how many BTUs of Cooling Capacity you will need to cool the size of room you're placing it in. BTU is an acronym that stands for “British Thermal Unit,” although the British part isn’t an exclusive thing anymore. The BTU is the standard unit of measure to convey how powerful a portable air conditioner is. The number of BTUs directly corresponds to the size of the room or space you need to cool. 1 BTU equals the amount of energy needed to raise (or lower) the temperature of 1 pound of water by 1°F at sea level. When applied to an air conditioner, this refers to how many BTU’s of thermal energy (heat) the air conditioner can remove from the air around it, per hour. The higher the BTU rating, the larger the room you can cool with it. But more is not necessarily better, when it comes to BTU rating. To get the right results without spending too much on energy, you need to pick a portable air conditioner that has the correct number of BTUs for the room size you're trying to cool. Too high or too low won't work. If you use a unit with a BTU rating that's too high for a small room, then you’ll get mediocre results and reduce the life of your unit. The unit will cool too fast, then cycle off and then back on far more frequently than it was designed to do. Cycling too quickly also causes the unit to not remove enough humidity from the air. So in the end, you'll get an overworked air conditioner, a higher energy bill, and a room that feels clammy due to the excess humidity. This is not an optimal result, to say the least. On the other hand, if you buy a portable air conditioner with an insufficient BTU rating for a large room, it will run non-stop as it struggles to reach your target room temperature. This will overwork the unit, drive your energy bills up, and leave you with a room that is still not cool enough. Every room is unique, and cooling energy requirements will vary by climate, etc. For these and other practical reasons, you can't always accurately calculate the exact number of BTUs you'll need for a given room. But you can get close enough to ensure you end up with the right sized unit. Manufacturers of portable air conditioners understand that buyers cannot calculate BTU requirements accurately, so they design their systems to cover a wide range of requirements and room sizes. When picking a portable air conditioner for a room, the rule of thumb is that it will need need about 20 BTU for each square foot of floorspace you are cooling. To calculate your square footage, multiply the longest length of the room by the longest width. If the space has ceiling higher than 8 feet, increase the amount of BTU you need by 10 percent. If your space is heavily shaded, lower the BTU rating by 10 percent. ​If the space is sunny and full of window light, increase BTU capacity by 10 percent. ​If there are more than two people who will occupy the space, add 600 Btu for each person. If the unit is used in a kitchen with appliances or in a server room, increase capacity by 4,000 BTU. Basically, any space that has anything that causes it to be warmer than a standard room, or increases its volume of air that needs to be cooled will need more BTU’s on top of the standard calculation. By following these guidelines, you can be sure you’ll choose the right-sized portable air conditioner for your room. 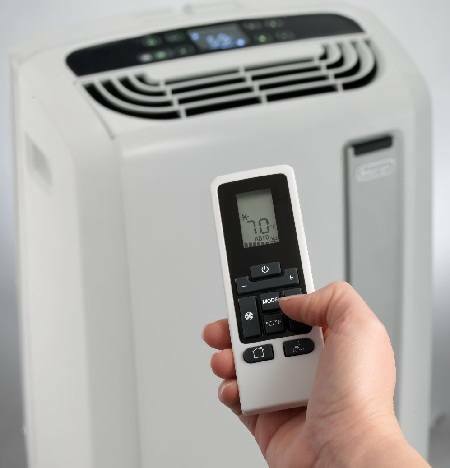 All portable air conditioners need to vent hot air out of the room being cooled, as a part of the cooling process. The hot air needs to be directed out of the room, or you’ll simply be pumping hot exhaust right back into the room and defeating the purpose of the unit. Portable air conditioners have two different ventilation options: single-hose, or double-hose. 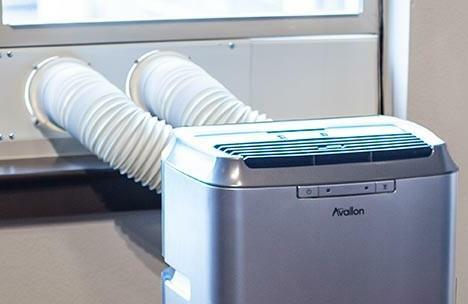 A single-hose portable air conditioner draws warm air from your room and cools it down before returning the majority of the air, now cooled, back into the room. Part of the intake air is siphoned-off and used to pull heat off of the air conditioner's evaporator; that air is warmed considerably as it does its job, so it is vented outside using the air conditioner's single exhaust hose. A dual-hose portable air conditioner pulls in room air, cools it down, and releases all of it back into your room. The unit uses 100% outside air to transport heat away from the evaporator unit. One hose pulls in air from outside to cool down the unit, and the hot exhaust air is vented back outside through the second hose. A dual-hose portable unit does not create the negative pressure in a room like single hose models do, and a dual-hose unit is often more efficient than a single-hose portable unit. The drawback to a dual-hose portable air conditioner is that some models use two internal fans, which can lead to a slightly higher energy usage. 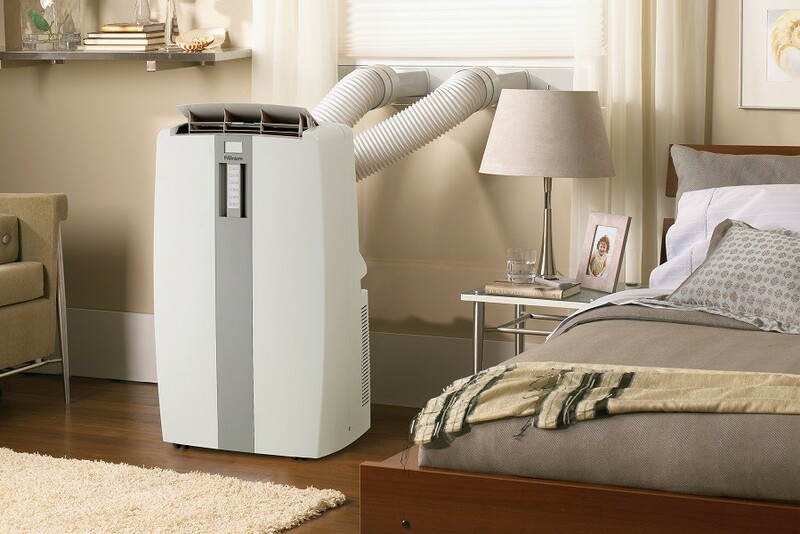 Choosing a unit that can work with the preferred ventilation opening in your room is a key consideration when buying a portable air conditioner. Most units are designed to vent air outside through a window, a door or a wall. Sometimes, you will need to do a little installation work. Most portable air conditioners come with a window kit to direct your ventilation outside. The kit includes either one or two vent hoses, a bracket, and some hose adapters. Installation is typically very easy, and really just involves opening the window enough to fit the bracket in, and then closing the window back down on it to seal the room off. The hose goes from the unit to the bracket, and directs airflow outside. This makes moving the unit to another location easy, as long as you have a window within the reach of the vent hose. It’s also possible to set up a ventilation bracket with a sliding glass door if you need the unit in a larger room. The idea is the same as a window install, but you may need a special kit, or an extra piece of bracketing to fit the space. Some may prefer to direct the hot air through a wall to outside or to another room or part of the house, such as a garage or storage room. Venting through a wall takes a little more ingenuity and planning, but can often be done with a jigsaw and some well-placed measurements. Look at our gallery below for the general idea. No matter which ventilation method you choose, just be sure that you can ventilate your unit appropriately. Portable air conditioners cannot do their job without it. Many of the best portable air conditioners come with a range of popular options that give you more control and versatility over the unit’s operation. Most people like to have a unit that does more than just power on and off. Units that have programmable features let you to set specific temperatures, air speeds, and duration of operation. This can be especially helpful when you are trying to control the noise level of a unit, or have the air conditioner operate and maintain a specific temperature for a set time. Some units have a built-in electrical strip that allows you to plug in other cords and devices. That can come in pretty handy. If you want to heat a room in the winter and cool it in the summer, then look for units that have a heat pump, which can push heat in either direction. If you’re in an in-between season like spring or fall, and need to alternate from heating to cooling depending on time of day, a unit with a heat pump can be especially convenient. 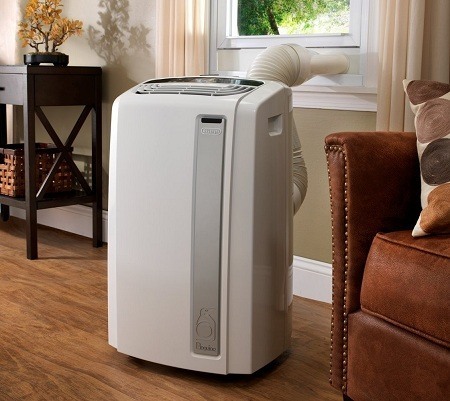 Many portable air conditioners can double as a dehumidifier, giving you a two-in-one appliance that can save you money and maintenance, especially when using one in an area such as a basement. 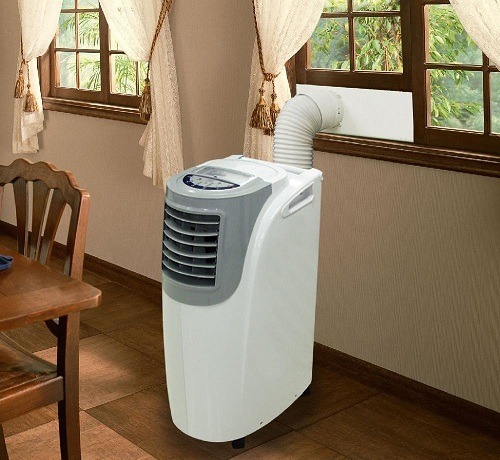 While all portable air conditioners act as a dehumidifier to some extent, some have exclusive settings that allow them to operate solely as a dehumidifier. The vast majority of portable air conditioners are not completely silent. 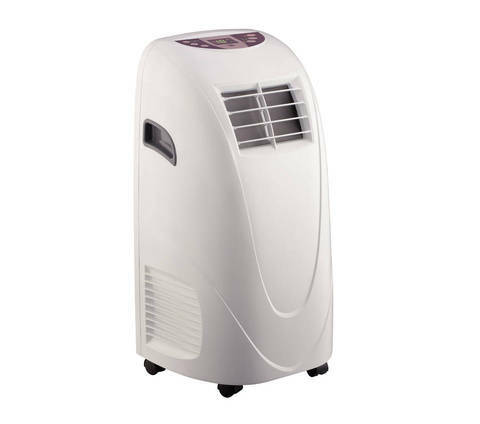 Depending on the main location of your unit, the decibel noise level and even the quality of the sound emitted can be very significant when deciding on the best portable air conditioner for your room. In the bedroom, decibel level may not be as important as the type of noise emitted. Some people prefer to have what’s known as “white noise” when they are sleeping, which is exactly what many portable air conditioners generate. Because they often cool warm, humid air, portable air conditioners need some way to remove water from the air and to get it outside of the unit. Every unit will have water condensation inside that needs to be dealt with. There are four main methods used to handle condensation; each has its own pros and cons. Self-evaporative units exhaust all of the condensate that is built up by sending it out with the hot exhaust air. This means you’ll never have to deal with dumping or draining water. If you want to constantly leave your unit unattended, this is your best option. That said, some fully evaporative are not suitable for extremely high humidity environments - make sure you check the relative humidity range on a unit, before you buy. Partially evaporative units can evaporate most of the moisture into their own hot air exhaust, resulting in little to no water to empty on your own. The amount of drainage or tray dumping required depends on the usage time and environmental conditions of the area being cooled. 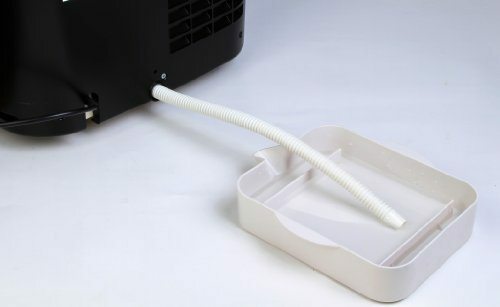 Most portable air conditioners have the option of a permanent water drain hose connection to ensure that any water condensation is drained outside. Most drain tubes direct the water to a nearby floor drain. Condensate pumps are a separate accessory. They help to pump the collected water through the drain hose. This means that the hose can be routed upwards and through a window, for example, if you need to cool a basement. The simplest portable air conditioner models have an internal container that collects the extra water. These trays or buckets need to be dumped out on a regular basis during its use. As mentioned earlier, noise level can be a big factor when deciding on a portable air conditioner. While some units are quieter than others, they tend to trade off features to result in a quieter operation. With a maximum decibel level of 55 dB, the 62 lb. 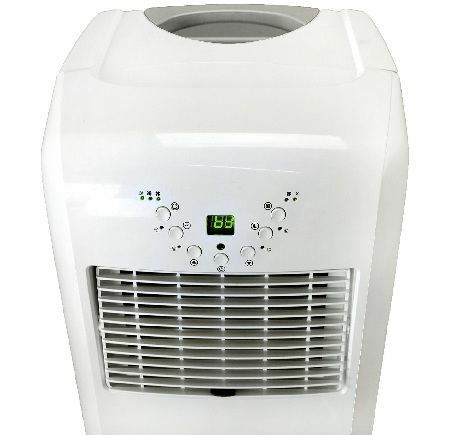 Honeywell MN12CES offers plenty of features and cooling power, with a tolerable noise level at even the highest cooling settings, making it the best all-around unit with a noise level on the quiet side of the spectrum. The Honeywell MN12CES has a cooling capacity of 12,000 BTU, making it adequate for rooms up to 400 square feet. It includes three different fan speeds, along with a timer that you can set to shut off for when you aren’t nearby. The Honeywell MN12CES is a single-hose mode that includes a window ventilation kit that takes just a few minutes to install from start to finish. With the Honeywell MN12CES, you never have to worry about tending the moisture build-up thanks to the auto-evaporation system. The Honeywell MN12CES comes with a remote control that allows convenient operation from anywhere in the room. If you do end up using the controls on the unit, you’ll appreciate the easy touch controls on the LCD display panel. This unit can also be used as a dehumidifier, ridding a space of up to 70 pints every 24 hours. The whole point of a portable air conditioner is to be portable, so it makes sense that they should stay on the small side of things. The smallest units also tend to blend a little better in a room, helping with the room’s overall aesthetic. As far as small portable air conditioners go, you’ll be hard-pressed to find a better unit that combines both performance and size than the AC-10100E Ultra Compact from NewAir, which measures 12.1 x 15.1 x 29.8 inches and weighs just over 60 lbs. The AC-10100E has a BTU rating of 10,000, making it useful for rooms under 3oo square feet, while taking up minimal space. This unit uses a single hose system, and comes with a window installation kit that can accommodate windows up to 42 inches. The AC-10100E is self-evaporative, which means you rarely have to worry about emptying the unit’s moisture build-up. While it’s not quite a﻿﻿uto-﻿﻿evaporative, it’s almost there. The AC-10100E comes with a 12-hour timer, sleep mode, a remote control, and an auto-fan function that automatically maintains your set temperature by raising and lowering the fan speed. The Shinco 10,000 BTU unit is no-frills when it comes to features, but it is a very efficient unit that makes use of a sleek, pleasing design that easily blends in to any room while providing smooth and quiet operation. No surprise here, given its size: this Shinco uses single-hose ventilation, and includes a standard window kit. If you prefer not to empty your unit, you’ll appreciate the Shinco. It utilizes a self-evaporative system that also works to cool off the condenser by recycling any remaining condensation. The Shinco has a 2-Speed cooling fan along with a 4-way air direction help spread the air evenly throughout the space. A remote control lets you control the air conditioner from across the room, while digital controls give you an on-board option. The DeLonghi America PACAN120EW 12,000 BTU Whisper Cool Portable Air Conditioner offers the best of both worlds when it comes to a mid-size unit, combining quiet operation with ample cooling power and some nice extra features. This unit ventilates outside using a single hose that measures around 5 feet long, but can be extended to 8 feet if you need some extra room from the unit to the window. The DeLonghi America PACAN120EW evaporates condensation on its own by recirculating it within the system, so no annoying buckets or drain hoses here. There are plenty of added features worth mentioning. The unit’s BioSilver air filter traps bacteria, dust and pollen, while also preventing the growth of mold and mildew. The namesake Whisper Cool function cuts the noise down by about 50%, while the Real Feel mode controls the room’s humidity and temperature blend. The unit’s remote operates the unit from across the room, and also stores easily in the top of it. Durable casters make moving it around fairly effortless. Few full-size portable air conditioners actually deliver like the Whynter ARC-14SH, especially when you consider its low price. The Whynter ARC-14SH utilizes a dual-hose ventilation system, helping its efficiency while noticeably balancing out the room’s air pressure and feel. For a large room, that's important. 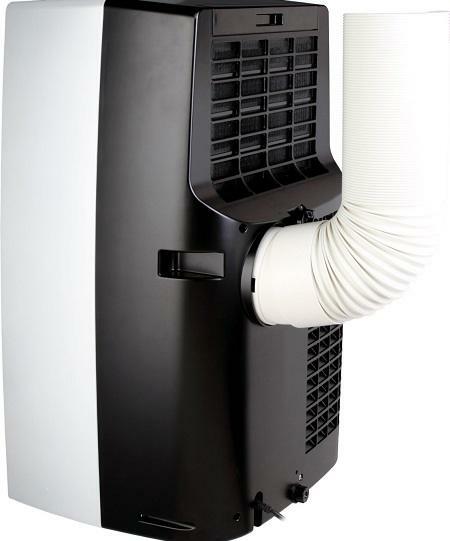 The Whynter ARC-14SH completely recycles any remaining condensation that its auto-evaporative system misses, cooling its condenser and balancing out humidity. The controls are very simple and easy to use on this unit, and that includes its remote control. You can program temperatures, change fan speeds, and use preset timers with ease. The Whynter ARC-14SH also includes a washable air filter that helps neutralize odor, and an also heat and dehumidify. It truly does it all, while still being easy to move from room to room. Our 5-star rating system considers the following features and specifications. We give a lot of priority to third party verified owner reviews of each model. For a model to make our short list, they need to have a 3.5 star rating or higher on at least one major consumer review or retail site. 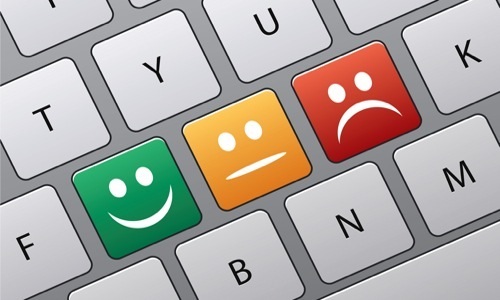 We give priority to products that have over a dozen ratings across multiple sites. This is obviously the most important factor when assessing a unit. Higher BTU ratings almost always come with a higher price, and often a few more features. We prefer units that deliver the highest BTU-per-dollar. A portable air conditioner can be the coolest, most feature-rich unit on the market, but if it’s loud, it’s going to go down on our overall rating. 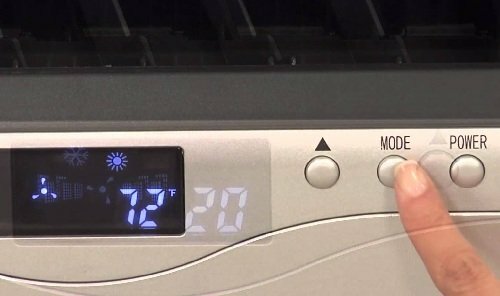 The best units operate at a tolerable level (~77db or lower) on a maximum setting, and a very quiet level (~55-60 db) when they are on low and medium fan settings. The fans aren’t the only thing that adds to the noise level. Compressors play a big role as well. The lower the weight, the more portable the unit is. Nobody wants to deal with an unnecessarily heavy air conditioner, even if it has all the extra features you appreciate. Moving it around your property should be fairly easy, which requires a lower weight. We are firm believers in getting what you pay for. If we don’t think a unit’s price reflects its actual value, then it won't make our short list. We prefer dual-hose ventilation over single-hose, due to the more efficient operation and lack of back pressure issues. That said, most portable ACs are single-hose. All things being equal, we prefer units that are auto-evaporative systems which remove all humidity from the room without requiring drainage tubes, buckets or trays. That said, achieving 100% auto-evaporative exahast often comes at the expense of a higher noise level and less energy efficiency. Some extra features barely improve the unit, while others have a huge role in its overall functionality, ease of use, and operation. Features such as a remote control, different fan speeds, and additional capabilities such as heating and dehumidifying can really help to push a unit over the top.